Courtesy of The New Yorker’s website. In the Improbable Interview Series, we interview people way out of our league. This week: Mary Norris, a long-time copy editor at The New Yorker. I’m not going to lie to you, this one is personal. 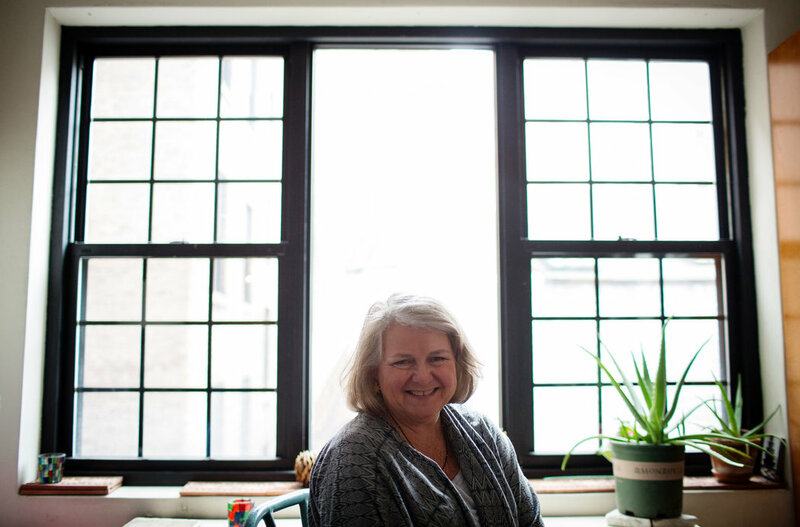 Mary Norris, one of the eagle-eyed query proofreaders at The New Yorker, is one of the premier editors in the country, and she’s one of my literary heroes. She’s edited some of the best writers in the country, and her utterly enjoyable new book, Between You and Me: Confessions of a Comma Queen, came out this April in paperback. Read it. Josh: What does an a query proofreader [a page O.K.’er] do? Mary Norris: What we do, it’s a copy editing thing, combined with proofreading, line editing, and query proofreading. At The New Yorker, a copy editor technically only fixes mechanical things, spellings, and a little bit of punctuation, for instance a serial comma. We do that. We do proofs on everything that goes in the magazine, except for the “Goings On” section. That department has its own staff copy editors and O.K.’ers. Besides that, besides reading the thing thoroughly and making suggestions, whether it’s fiction or non-fiction, we follow it up. On each piece there are two proofreaders, and one of them is the page O.K.’er and that is the proofreader of record. At some point, the piece becomes the O.K.’er’s responsibility to make sure it’s correct. When it goes to press, there are two proofreaders reading it. The second proofreader usually gives the proof to the page O.K.’er so that they’re combined into one proof just to save the editors some time. And then those changes that the editor and the author choose are put into the electronic file, and we all read it again—the fact-checker, the author, and the page O.K.’er. We make sure that no mistakes were introduced when changes were put on, and we have one last round on each piece after it’s been seen in layout. And we have a meeting, and we go through it page-by-page and discuss changes, and then the O.K.’er puts in those final changes before a piece goes back to makeup then to press. J: So that is a whole lot of editing. It reminds me of something my high school newspaper teacher told me. He was introducing all the different positions at the beginning of the year. He said, “Oh if you want to take photos do this, if you like sports do that, and if you’re a special kind of sick, you should be a copy editor.” You’ve been one for decades now. What keeps you sticking around doing that? What do you get out of it? MN: You know, when you’re a writer, generally you need to have a side line, right? I mean, a writer needs a day job unless that writer is extremely lucky. J: Even Marlon James, you know? Even Marlon James is teaching! I was in graduate school, and I tried teaching and I didn’t think I was very good at it, and also the whole academic route I was disillusioned by. I didn’t feel cut out for the academic life. MN: Between college and graduate school I’d gone back to Cleveland and had a few jobs. I’d driven a milk truck for a while, and that was my best job ever. And going back to graduate school after that, I was never quite as satisfied with school as I had been before. You know, I loved college, and I did fine in high school and all through school, but once I’d been out in the real world and worked, I was impatient with school after that. One thing [school] did not develop was common sense, and then I found driving a milk truck did develop common sense. It was good for my real-life skills, you know? So after graduate school, I was trying to decide what to do, and there were really only two possibilities. I could teach high school in Vermont where I was living after graduate school, or the other possibility there was trying to find a publishing job in Vermont. At that time there was only one publisher that I knew of in Vermont, and it was a publisher of the garden catalogue and sold tools and carts that are the new version of a wheelbarrow, sooo it was at that point that I moved to New York and tried to find a job in commercial publishing. What it comes down to for me was working with words in some form was something I was good at, and it was preferable to me rather than working say as a waitress, something I was not good at. My entry position at The New Yorker was in the library. We took apart the magazine, indexed it, and we cut it up with razor blades and pasted it into these big scrap books for the writers. I’m certain they don’t do that any more, which is too bad because those scrap books are a thing of beauty. But anyway, I knew that there was this job called copy editing, and I knew that you read manuscripts and looked up words in the dictionary, and you got to apply your wit to the work, whether it was just noticing that something was misspelled or learning the peculiarities of New Yorker spelling and learning to apply them. J: Do you have a favorite sentence or phrase that you have seen go into the magazine, or are there any big copy editing regrets that you have? I do feel bad that I made Oliver Sacks change his style on the word sulfur. He used to spell with a p-h, s-u-l-p-h-u-r. And The New Yorker style on sulfur is spelled with an f, s-u-l-f-u-r. And his editor, John Bennet, came to me several times saying, “Can we please let him spell it with a p-h?” I don’t know why I was so adamant, but we didn’t change anything, really. I didn’t see the point in breaking style for the spelling of sulfur until the piece was already printed, and then I realized that he had a childhood memory of the word spelt with a p-h, probably from his chemistry set growing up in England, and I wish I had let him spell it with a p-h. I wish I had let him break style. MN: Did you say fancy or antiquated? MN: Oh all right, fancy, good. My reading on that is simply that it’s a holdover from the original editors, from Harold Ross who was an Anglophile and a Francophile. He thought it was sophisticated to use accents over French words or even an accent over a capital letter in French—which the French don’t do—and I think probably his devotion to the diaeresis, the double-dot over the second o in cooperate, was quite the same thing. I agree with anyone who says that’s out of fashion, that’s out of date. It’s still when I speak ex cathedra, and that is as somebody who works at The New Yorker and follows New Yorker style, I defend it by saying it has a legitimate use. But I also understand that people aren’t going to mispronounce cooperate as couperate or re-elect as reléct or even naive as nave. These words are all recognizably English now and don’t need those extra marks, and I wouldn’t go out of my way in my own writing to put them on. The hyphens are—I don’t really understand while we’re still hyphenating teen-aged, but it seems we’ve gone this way for so long, it would also seem pointless to change it. J: Your book Between You and Me is out in paperback now. How do you feel when you’re writing versus when you’re editing, and how does your experience as an editor at The New Yorker factor into how you go about writing your books? MN: My experience as an editor at The New Yorker has given me some pretty high standards. You know, I’ve gotten to read some great stuff, and I think I’ve absorbed it on some level by osmosis and it’s made me a better writer. Of course it’s wonderful to be recognized as a writer after having copyedited for so long and at the office been pigeonholed as a copy editor, because I never started out to be a copy editor. I’d always wanted to be a writer, so it’s very gratifying to be recognized as a writer. Of course I’d prefer to be a writer, and I’d prefer to have my time to myself to write, but I also have had to make a living, and writing can be pretty draining the same way that teaching can be draining to a writer. So sometimes when I go back to my job, it feels like a relief to just do a job and not have to be creative, you know? MN: Well, I have a voice, but it doesn’t ask me what I would do. It asks me what my betters would do, the people who taught me. I used to have a really hard time when Eleanor Gould, The New Yorker’s legendary copy editor and grammarian was alive. When I was trying to write for “Talk of the Town,” I always tried to think what she would do. My goal I think was to write a piece that she didn’t have any corrections on. That was a mistake. You really can’t edit and write at the same time, and for me to try and keep Eleanor from changing anything I wrote, it just inhibited me too much. I’d hardly ever get past the first paragraph. J: You’re probably someone who thinks about pronouns more than most people, and I was wondering if we could talk about how you think about gender pronouns. How do you see the relationship between language and gender, and how has your personal experience affected that? [Norris’s sister Dee is trans]. MN: Well that is the hot-button issue in language right now, not only the thing that grammarians worry about, the use of “their” as a singular, but what we think about more is the use of “their” as a substitute for “his or her.” There are these two questions right now about pronouns, and one of them is about grammatical number, and the other is gender. Anyway, what I think is that you should call people what they want to be called. I also realize that it’s not that easy. We learn pronouns so early in life. It’s certainly deeply embedded. J: How did your experience with Dee shape that view? The pronouns are powerful. My consciousness was at least raised as a feminist. I began to react to that masculine universal “he” and “him” and think it should sometimes be “she” and “her,” and certainly if you were a woman your pronoun of default might be a feminine pronoun instead of a masculine one, so I had that in place. But when Dee changed genders it was hard for me to start calling her Dee for one thing, but what was really hard was to catch every instance of a pronoun and get the right one, the feminine instead of the masculine, when I was so used to using masculine for my sibling. But what convinced me to do it was how sensitive she was to it. I figured out finally that it was so hurtful to her to have me use the wrong pronoun that I began to make a supreme effort to use the right pronoun. You know, even now, I was working on a memoir of having a transgender sibling. I was not having a lot of luck getting it published, and in the meantime I got this contract for a book about grammar and copy editing, and Dee was really excited, so part of my deal about the memoir with Dee was that I could write anything I wanted to as long as she didn’t have to read it. But what happened was I got this other book deal, and my relationship with Dee is really a very good one now, and I then had to write about gender. I originally had only a parenthesis about having a transgender sibling and how that maybe made me more open to non-traditional use of pronouns. My editor really wanted me to open that up and give that chapter on gender a personal ending, and I was reluctant because I knew that Dee really wanted to read this book and not read about herself in it. We had a discussion about it over email overnight. I was torn between the demands of my editor and the sensitivities of my sibling. How it worked out was that Dee was able to articulate exactly what bothered her, and I was able to write around it, so in the end she was okay with what I wrote. But that experience made me more sensitive than ever to the pain of people in these positions of having to be called by the wrong pronoun. It made me think I don’t really need to publish this memoir now if there would be things in it that would hurt her. J: Do you think the consciousness needs to come before people use the new language, or do you think the language can help change the consciousness? Or is it some combination? MN: I think it is some combination. Right now the consciousness is being raised by the transgender world, and it does take a conscious push to change the language. J: My last question is this: I bet you probably get a lot of journalists who exclusively want to talk to you about words and writing and that sort of thing. Is there anything that no one ever asks you that you wish you could tell the world? Maybe you don’t want to sit around and talk about grammar all day. MN: [Laughs] Oh, that’s a good question. You know, I do get really tired. People expect me to engage passionately about every aspect of spelling and grammar, and while it turns out that if I am engaged I turn out to have an opinion, I also don’t feel that these are high moral issues, you know? Let’s see. It was really meaningful to me when I was in a class recently at Princeton. I was invited to John McPhee’s non-fiction seminar. Somebody asked me, one of the young women, if I ever wished I had been published earlier as a younger person. I think my instinct was to be defensive and say, “No, everything is perfect just the way it is!” But later I thought, “Well, of course! Duhhh!” I was 60 when I got the contract to write the book. You know, that’s pretty old to be getting published for the first time, but the consolation of it is that I can handle it. You know? This is not world fame. MN: No, it’s a little bit of recognition. For somebody to be a celebrity copy editor is really an oxymoron. A copy editor really is somebody who is behind the scenes and shouldn’t attract any attention. So a celebrity copy editor is a freak [Laughs]. And I’m ever-so-glad it happened, and for a lot of copy editors it’s important that this book is out there because it shows what we do and that we have a place and we’re more important than the writers and the editors think. It’s given my department at work a real shot in the arm. It’s important to people. Ever since the book came out, I’ve had to double and redouble my efforts not to let any mistakes into the magazine. J: I will say, as I was preparing for this interview, I was sitting there reading the latest issue. I was just wondering which of the articles you touched. MN: Since this was the most recent issue, probably none because I haven’t been at the office all this month. MN: [Laughs] Did you find any mistakes? J: None that I’d tell you. This interview was condensed for length. That’s the interview. Now we want to hear what you think. Leave us a comment here or on Facebook, and shoot us an email at thespark@macalester.edu if you have an idea for our next Improbable Interview.